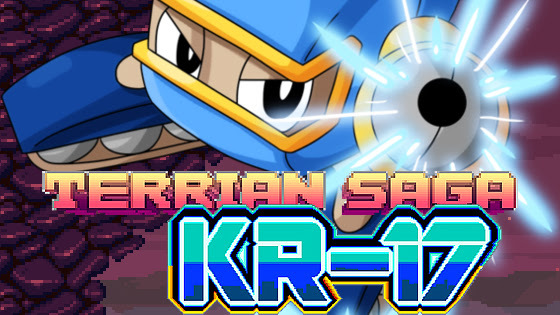 “Terrian Saga: KR-17” is an admirable tribute to the games that once defined the industry. This 32-bit side-scrolling action platformer is not only one of the best titles to come out so far this year, but also yet another reminder that the indie scene is where gaming is at. As frustratingly difficult as it may be, there’s plenty of intense platforming, awesome boss battles and other madness to keep players’ motivations heated and their heads cooled. There’s no shortage of retro style games. In fact, nowadays, the market is flooded with retro adventures that take on similar aesthetics as “KR-17.” Thankfully, the game doesn’t rely on its visuals to attract gamers. Just about every aspect of “KR-17” was thought through carefully and given a proper polish, from its sound to its gameplay. KR-17 is the name of our hero, a rogue military drone who sets off to uncover the truth about the ongoing conflict between twin solar systems: the Terrius (where KR is from) and Cyrinus systems. The story is interesting, but it’s certainly the weakest component of the game. On average, levels tend to carry on for about 45 minutes or so, and while there’s some in-game dialogue during that time, the more meatier bits of narrative are told in between zones; however, it seems as if the game is rushing itself to get players back into the action. That’s not entirely a bad thing, but it would have been nice to see the writers take a bigger risk at telling more story. Joining KR on this adventure is J1M, a talking guided missile who looks like a yellow version of Bullet Bill from “Super Mario Bros.” J1M is the sidekick, who occasionally offers insight and advice to KR, but he’s also good for taking out enemies from a distance and blowing away obstacles preventing you from advancing. J1M is only one weapon in KR’s arsenal. The rest includes, grenades, a laser gun, antipersonnel mines, C4-like explosives and a flamethrower. Aside from the laser gun which is the primary weapon, there’s a meter in the upper lefthand corner of the screen — right below the health meter — that limits the use of these weapons. Once it runs dry, you’ll need to recharge at one of the many charging stations spread across the boards. Each of “KR-17’s” many locations are very distinct. While the enemies will mainly remain the same, there’s an impressive amount of variety offered in the 60-plus boards present in the game, so much so that during your roughly 10-hour playthrough you’ll almost never feel like you’re doing the same thing twice… except for dying, of course. You’re going to do a lot of dying. The game’s challenge comes from its harsh platforming. Enemies are mostly there as an added threat. But as you progress through the story and less save points begin to pop up, traversing through the increasingly complex boards becomes more and more troublesome. Even most of the boss battles don’t require a single shot, just a lot of quick thinking and jumping. Boss battles are certainly the most difficult stages, and some might require more deaths than you’d care to count, but they’re also some of the funnest moments that you’ll eventually overcome with a little (or a lot of) trial and error. The only exception is the final boss, who is disappointingly the most uninteresting boss in the game. The final battle consists of mostly dodging incoming attacks and, well, that’s pretty much it. Plus, there’s really no clever platforming involved. Nevertheless, “Terrian Saga: KR-17” is just a fun time. Its addictive gameplay and blast from the past look and sound is pure awesomeness, and hopefully the series’ next installment takes a bigger risk with delivering a compelling story and builds upon the steady foundation created by its predecessor. Expect to die quite often, but also expect to do so with a smile on your face.